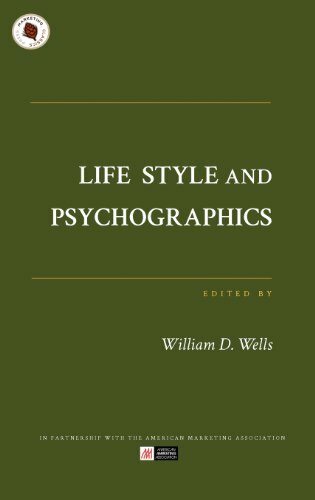 Synopsis: Life Style and Psychographics provides an opportunity to obtain a firm grasp of the emerging dimensions of life style and psychographic analysis. The specific applications, accomplishments, and research findings are fully discussed. Topics of discussion include: -Conceptual, measurement, and analytical problems in life style research; -The role of psychographics in the development of media strategy; and -European developments in psychographics. This thoroughly detailed work is written by a variety of distinguished scholars, all drawn together by first-hand research and a firm belief in the value of life style and psychographic analysis. It will prove highly useful to market researchers and strategists, as well as students and faculty of business, economics, and management. Dr. William D. Wells is Professor of Advertising at the University of Minnesota's School of Journalism and Mass Communication. Dr. Wells is the former Executive Vice President and Director of Marketing Services at DDB Needham Chicago. He is the only representative of the advertising business elected to the Attitude Research Hall of Fame. Dr. Wells was formerly Professor of Psychology and Marketing at the University of Chicago. He joined Needham, Harper, Chicago as Director of Corporate Research. He is the author of more than 60 books and articles.